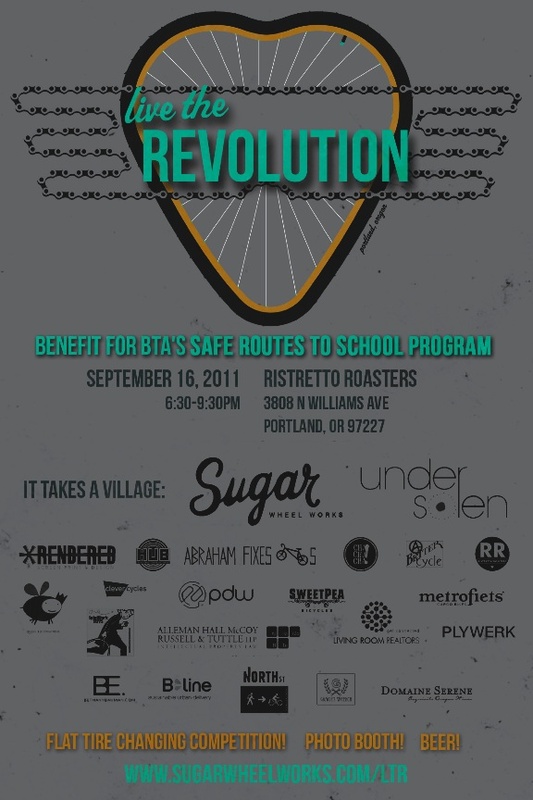 Sugar Wheel Works is throwing its 2nd Annual Live the Revolution benefit on September 16 from 6:30 to 9:30 p.m. at Ristretto Roasters. Sugar was born of the love for the hand-built bicycle wheels and its powerful ability to revolutionize rides, lives and communities. The work begins with the small things. How the company operates is equally important as creating and building a quality wheel, which is why founder and owner Jude Kirstein is organizing a benefit for the second year that celebrates Portland’s love for bicycles and supports two great causes: the Bicycle Transportation Alliance’s Safe Routes to School educational program and a program in Gresham started by two teachers called Wheelz. Sure to be a good time, the event will feature a wheel changing contest, a photo booth through RM Photo and a raffle to give away some sweet gear! With all of that and all the proceeds benefiting programs to get kids on bikes, it's definitely a party you don't want to miss! A good cause is definitely a good excuse to party. Can’t come to the event and want to pre-order your limited edition t-shirt? Email revolution@sugarwheelworks.com. T-shirt is $15. 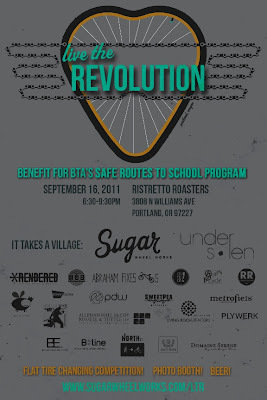 All proceeds benefit the Safe Routes To School Program and a program in Gresham started by two teachers called Wheelz. All T-shirts will be mailed for an additional $3 the week of September 5. Support the growth of a healthy community. Be part of The Revolution.